Today I present the input of four writers I know who are NOT affiliated with THGM Writing Services, but are nevertheless well-respected writers who serve their clients well. They will share with us the habits they use to make themselves superior writers and more productive with their time. Please feel free to address any of them individually in the comments. I have also included their Twitter handles, so that you can follow them there if you wish. Just for the record, I did NOT ask any of them to tell me what habits make them awesome. I wrote the title of this post after I received their input. But first, there is one habit that I employ whenever I can to be both a productive writer and a good writer. I put on a movie. Yes, a movie helps a lot! Why, because while the kids are watching a movie, I can work without distractions (assuming I can turn off new social network Tsu and Google Plus for a while, of course). The other technique that works well is to go to the library. These are just the steps I take. Your distractions might be different, so your steps might also need to be different. The bottom line is to unplug from distractions and get in flow. First, be a reader. Steven King once said; if you don’t have time to read, you don’t have time to write. This is so true. I believe that the first and foremost good habit you need to have to be a good writer is to read as much and as varied styles as possible. Reading will improve your craft. Somehow, everything you read will be stored somewhere in your brain and become handy when you most need it. Reading creates some sort of database in your brain that you can download as needed when it’s your turn to write. The more you read, the larger your database and resource you can dig from. Second, write every day. The second best habit you should have to be a good writer is to write every single day, no matter what. What make good performing athletes is their practice. It doesn’t matter how good an athlete is, because it’s practice that makes him more efficient and on top of his game. It’s exactly the same thing for writers. The more you practice writing, the better at it you’ll become. Don’t think, don’t try, just write. Write in batches. Don’t write one blog post at a time — write four, and then you’re done for that client for the month. Once you get into the headspace of your blog, or your client’s, it’s easier to stay in than to have to get back into it another day. If you’re getting images, get those in a batch, too. I’ve written a lot of dorky stuff for clients on arcane business topics, and I think the secret to producing mass quantities of this sort of thing is to find the enjoyment within the assignment. Find the challenge. Connect it to your own passions. Personally, I love to learn new things — so if I need to research a piece of news about surety bonds or something weird, that’s what drives me forward. Or find the human story within the business trend or profile that you’re doing. We all connect to people and their emotions and their struggles. Every writer is going to go about being productive in his or her own way, but for me, it all starts with getting organized. I put my topic, and the direction I need to focus on, down on a clean sheet of paper. Then I write down what I know about the topic, no matter how big or little those bits of information are. From there, I start my research and take what seem to be the most important bits of information and write out my notes. This allows me to be to go about writing in the most proficient manner. After my research, I begin to write out my rough draft. I aim to get close to my final word count, but I do not worry about hitting it at this point. I just want to make sure I get the required information into the piece I am writing at this point. After the rough draft, I go back and fill in any areas that were not explained fully. I do a second read-through and add in personality, questions to make the reader think, or something that will help what I had to say, stand out from others who have tried to make the same point. Finally, I go through and read my piece out loud. This helps me catch any mistakes I have made, and gives me an idea of how the piece is going to sound to others as they read it. Part of giving readers an amazing piece is making sure to read the piece from an outsider’s perspective. The more you can provoke a feeling through your words, the better your piece will be accepted by everyone involved. Organization and perspective can give every writer the ability to sound like a published author. 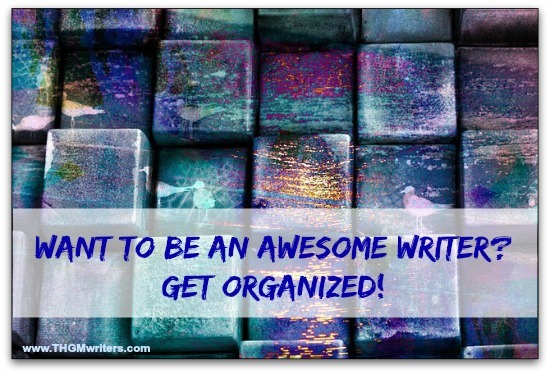 The most critical skill we need to become successful writers is the same skill we need to be successful at anything: being organized. This is especially true if you manage multiple blogs or work with many clients. What works best for me is teaching my clients and collaborators to use Trello boards. Clients create a card for each work request and assign it. When I start working on each piece of content I move it into ‘in progress’. Posts that are submitted to other sites go into ‘submitted’ and those that are live go into ‘published’. By using Trello boards, nothing falls through the cracks and the clients and any others working on the projects always know exactly what the status is of each task. Whether I’m managing quantities of content for one blog or have teams of writers working on a project, using Trello to coordinate all tasks works far better than wondering whether we last spoke on Skype, email or by phone. Speaking of Skype, we (collaborators, fellow bloggers and clients) leave it open all the time for quick questions. It is the most efficient form of communication. Making yourself available means opportunities you might not otherwise get. For example, if I’m working on content and think you may have something related I can link to or quote or a video or SlideShare I can include, if you’re on Skype you’ll end up mentioned. Skype and Trello are my two secret weapons. I can’t recommend them both enough. When you find the angle you’re passionate about, readers will probably enjoy it more, too. I am very honored to be in such great company with great freelance writers such as Carol Tice, Gail Gardner and Cameron Mackey. Thanks for the opportunity to share my two cents. I’m the lucky one here and it’s great to read all the others. Thank you for this post. I enjoyed reading the tips from the different authors on how they work and how they keep motivated. I am familiar with Carol Tice but Sylviane Nuccio, Cameron Mackey and Gail Gardner are new to me. I will have to start following them. Excellent points and all of them effective! I’d like to add that if you find something different, but it works for you, that’s okay too. The point is, once you find something(s) that work, KEEP DOING IT. Remember old habits might die hard, but so do GOOD HABITS, once you build up a routine of performing them. Thanks for the post David.